Who doesn’t love chocolate chip cookie dough? Last week I bought a tub of Eat Pastry cookie dough and had the bad habit of half baking a big spoonful of dough in a small ramekin dish and eating it with a spoon. Brent joined in on the fun, and when we finished the tub we decided we needed to find a healthier way to enjoy cookie dough. With a little bit of googling, I found this delicious recipe! 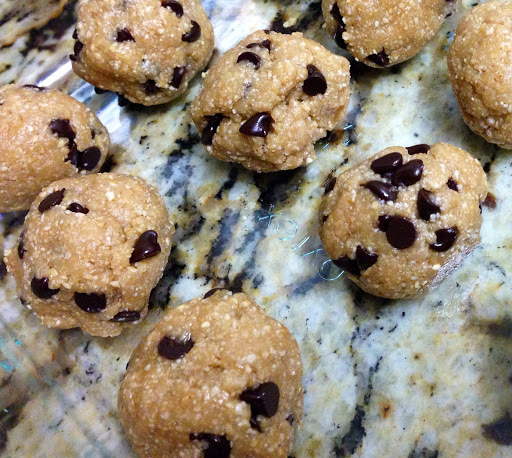 Cashews and oats give you protein and energy, but the sweetener and chocolate chips make it feel like an indulgence. Enjoy! 1. In a food processor, blend cashews and oats until they become a powder. 2. Add the agave, maple, vanilla and blend until incorporated. 3. Stir in chocolate chips by hand. 4. Form into small balls by rolling between your palms. Keep in the fridge or freezer. This entry was posted in Breakfast Foods, Sweet Foods. Bookmark the permalink.